Use a urethane adhesive systems which meet GM Specification GM?€‰3651G. Remove all mounds or loose pieces of urethane adhesive from the pinchweld area. 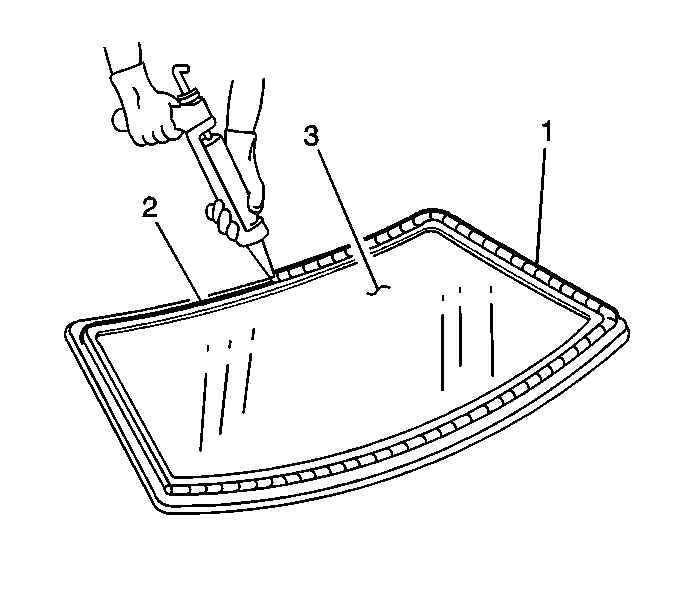 If the original window is being reused, remove all but approximately 2?€‰mm?€‰(3/64?€‰in) of the existing bead of urethane adhesive from the pinchweld flange by using a clean utility knife or razor blade scraper. If corrosion of the pinch-weld flange is present or if sheet metal repairs or replacements are required, the pinch-weld flange must be refinished in order to restore the bonding area strength. If paint repairs are required, mask the flange bonding area prior to applying the color coat in order to provide a clean primer only surface. Materials such as BASF?€‰DE15?®, DuPont ?€‰2610?®, Sherwin-Williams PSE?€‰4600 and NP70?® and Martin-Semour 5120 and 5130?® PPG?€‰DP90LF SPIES/ HECKER?€‰3688/8590 ?€“ 3688/5150 ?€“ 4070/5090 STANDOX?€‰11158/13320 ?€“ 14653/14980 products are approved for this application. 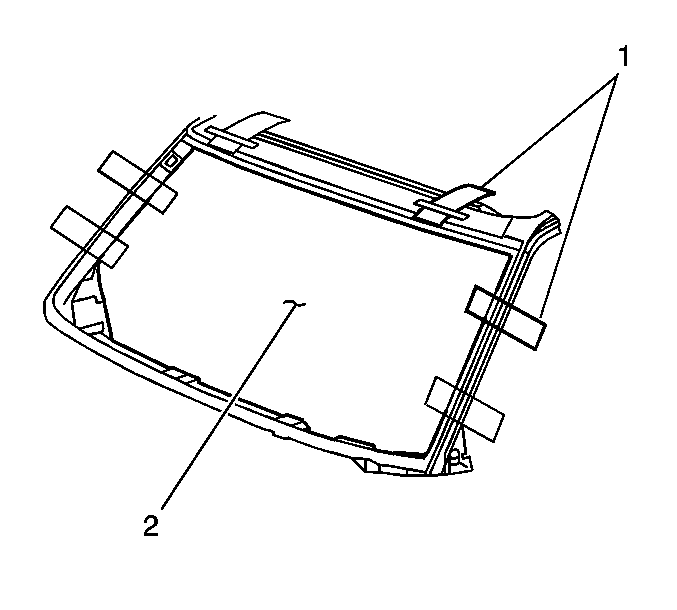 Remove all traces of broken glass from the outer cowl panel, seats, floor and defroster ducts. 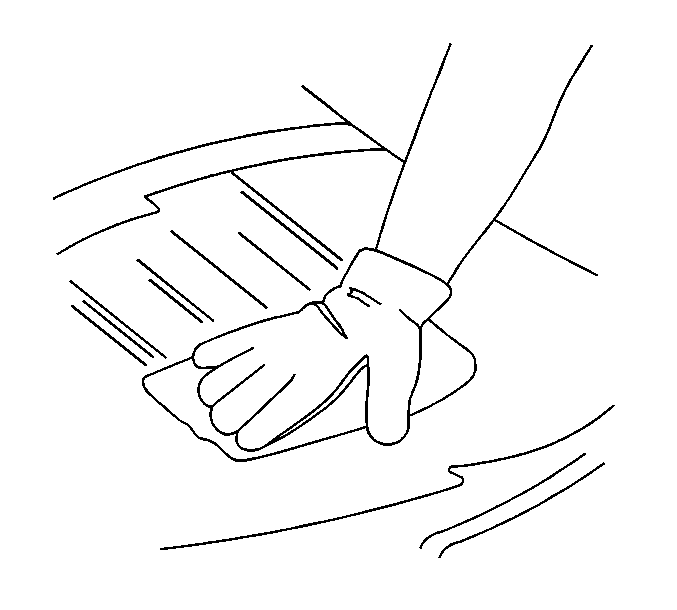 Clean around the edge of the inside surface of the window with a 50/50 mixture of isopropyl alcohol and water by volume on a dampened lint free cloth. Verify all primers and urethane adhesive are within expiration dates. Failure to prep the area prior to the application of primer may cause insufficient bonding of urethane adhesive. 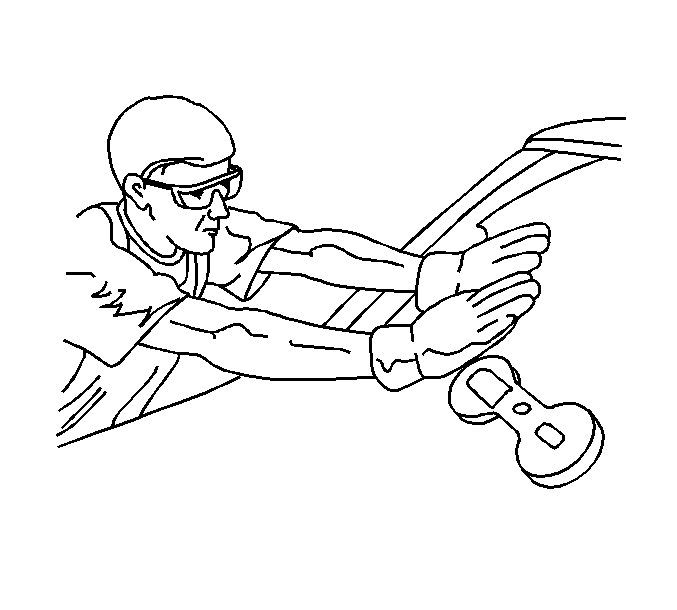 Insufficient bonding of urethane adhesive may allow unrestrained occupants to be ejected from the vehicle resulting in personal injury. Apply the primer to the surface of the pinch-weld flange?€‰(1). Allow the pinch-weld primer to dry per auto-adhesive instructions by the manufacturer?€™s. 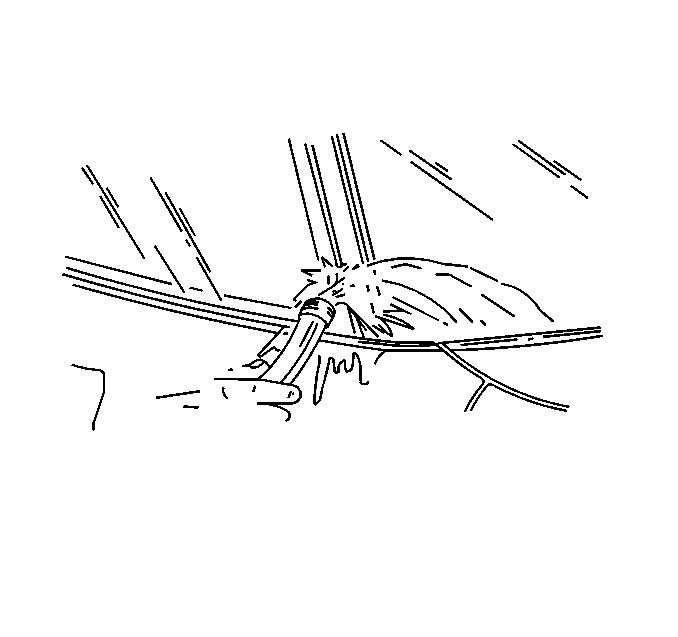 Use masking tape in order to mark the locations?€‰(1) of the window?€‰(2) in the opening. Cut the masking tape in the center and remove the window from the opening. Apply glass prep clear to the area approximately 10?€“16?€‰mm (3/8?€“5/8?€‰in) around the entire perimeter of the window inner surface. Immediately wipe the glass primed area using a clean, lint-free cloth. Apply bonded-glass primer and let dry per auto-adhesive instructions by the manufacturer?€™s. Apply the auto-adhesive primer-application?€‰(2) around the perimeter of the window?€‰(1) per auto-adhesive instructions by the manufacturer?€™s. Apply the glass primer black to the same areas?€‰(2) that glass prep clear was applied. Allow the glass primer to dry per auto-adhesive instructions by the manufacturer?€™s. Install the window reveal molding?€‰(1). Install the window reveal molding. 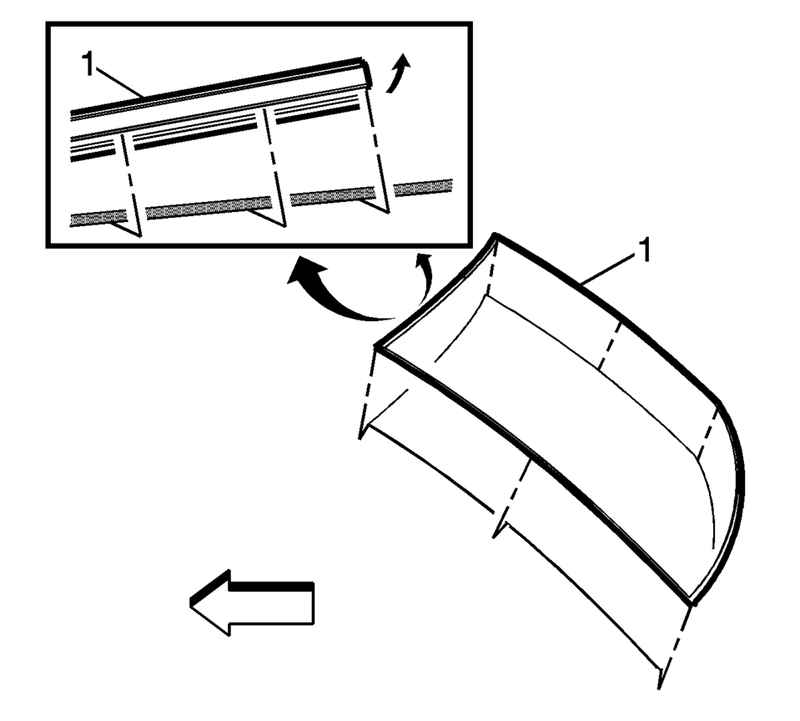 Refer to Rear Window Reveal Molding Replacement. Use a cartridge-type caulking gun in order to apply a smooth, continuous bead. 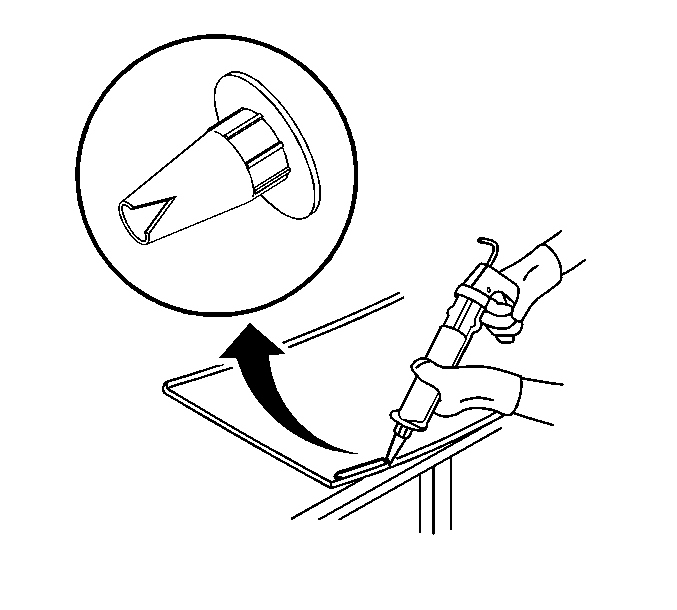 Cut the applicator nozzle to provided a V cut to apply the auto-adhesive. Use the edge of the window as a guide for the nozzle in order to apply the urethane adhesive?€‰(1) to the inner surface of the window?€‰(3). If the locating pins were cut off it will be necessary to tape the window in place until the auto-adhesive cures per auto-adhesive instructions by the manufacturer?€™s. 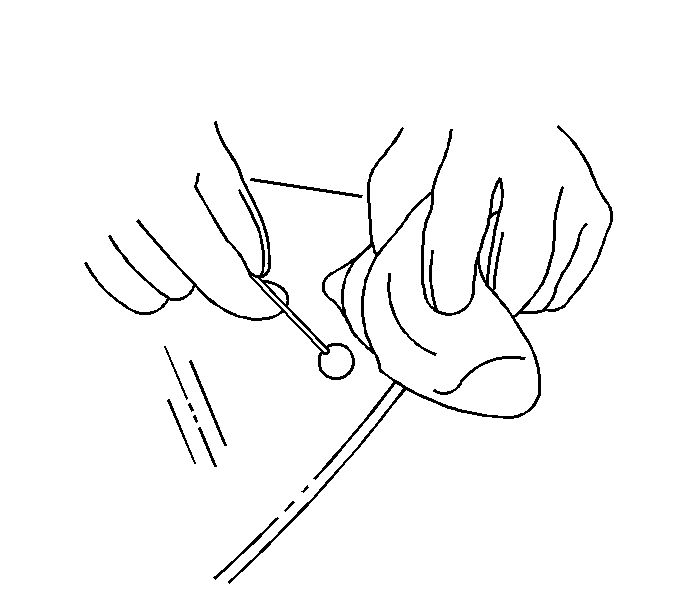 With an assistant, align the window locating pins?€‰(1) to the slots located in each corner of the pinch-weld flange. 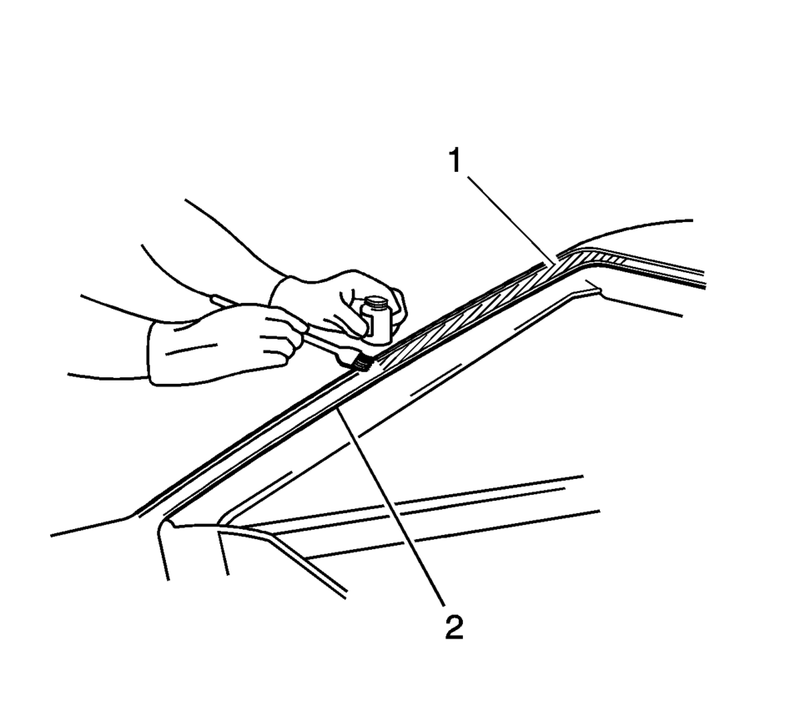 Lower the window?€‰(2) to touch the auto-adhesive. If the locating pins were damaged, align the masking tape?€‰(1) lines on the window?€‰(2) and the body. 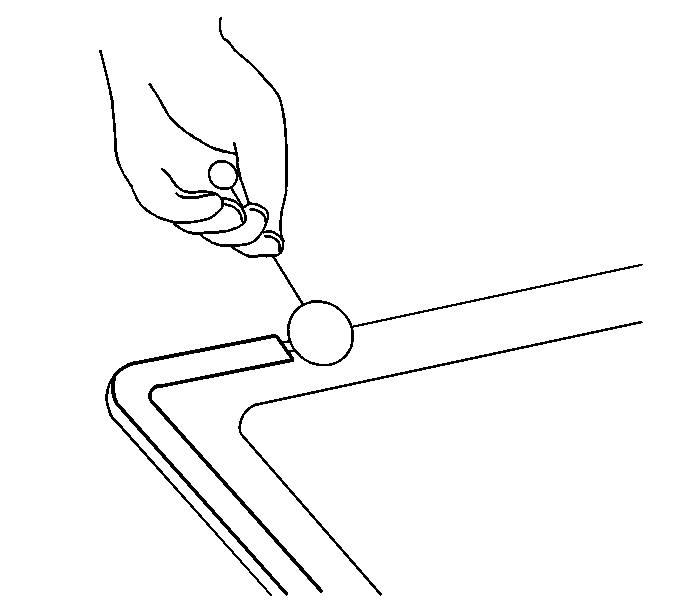 Gently depress the window on the auto-adhesive bead until the window reveal molding is seated. Tape the window to the body in order to minimize movement and until the auto-adhesive cures per auto-adhesive instructions by the manufacturer?€™s. Ensure all excess urethane adhesive is cleaned from the body before water test. Do not direct a hard stream of high pressure water to the freshly applied urethane adhesive. Use a soft spray of warm water in order to immediately water test the window. 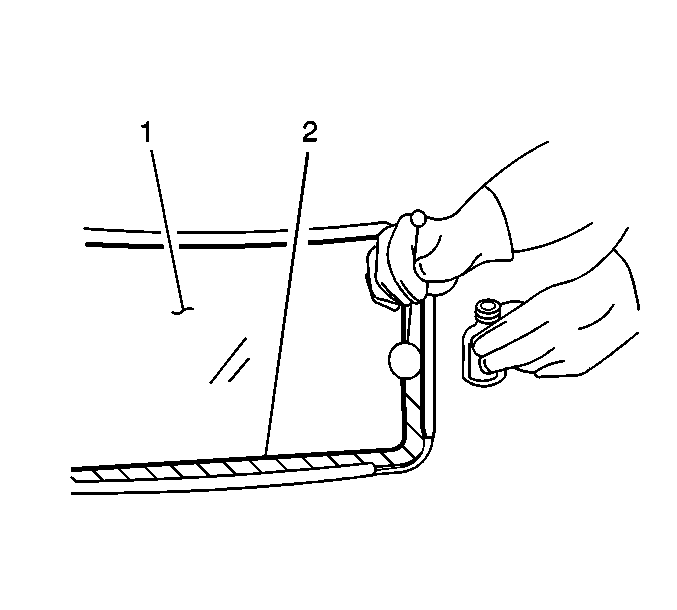 Inspect the window for leaks. If any leaks are found, use a plastic paddle in order to apply extra urethane adhesive at the leak point. Retest the window for leaks. Insufficient curing of urethane adhesive may allow unrestrained occupants to be ejected from the vehicle resulting in personal injury. For the moisture-curing type of urethane adhesive, allow a minimum of 6?€‰hours at 21?°C (70?°F) or greater and with at least 30 percent relative humidity. Allow at least 24?€‰hours for the complete curing of the urethane adhesive. For the chemical-curing type of urethane adhesive, allow a minimum of 1?€‰hour . 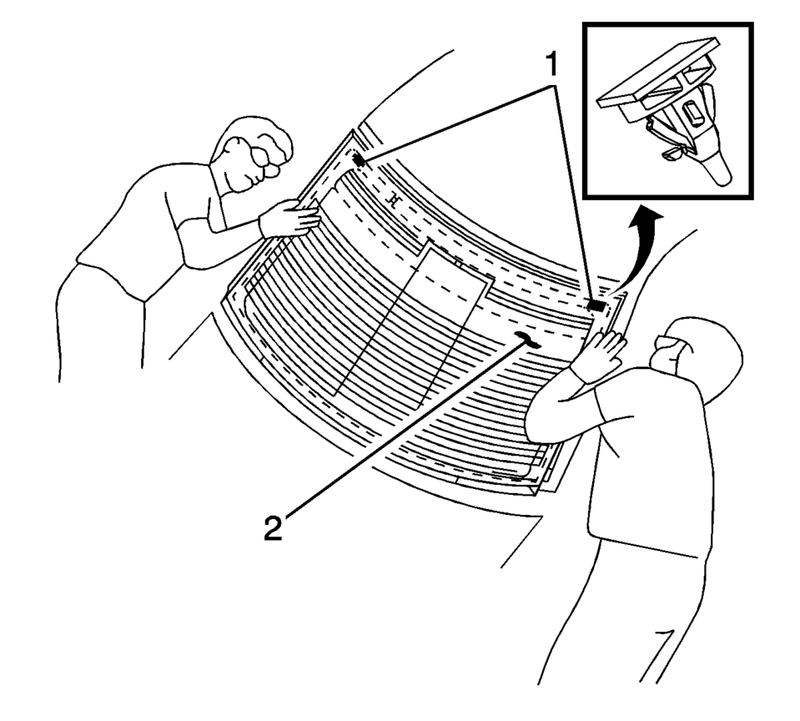 Do NOT physically disturb the repair area until after these minimum times have elapsed. Partially lower a door window in order to prevent pressure buildups when closing doors before the urethane adhesive cures. Do not drive the vehicle until the urethane adhesive is cured. Refer to the above curing times. Do not use compressed air in order to dry the urethane adhesive.